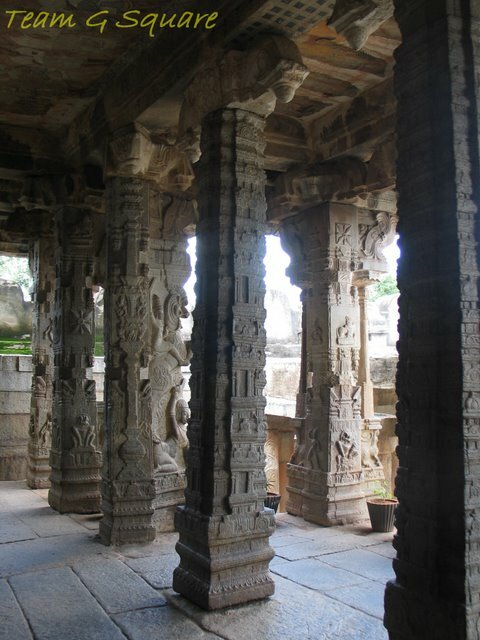 The 'Natya Mantapa' or the Dancing Hall consists of seventy beautifully carved pillars of which, twelve pillars situated at the center form the dancing hall. 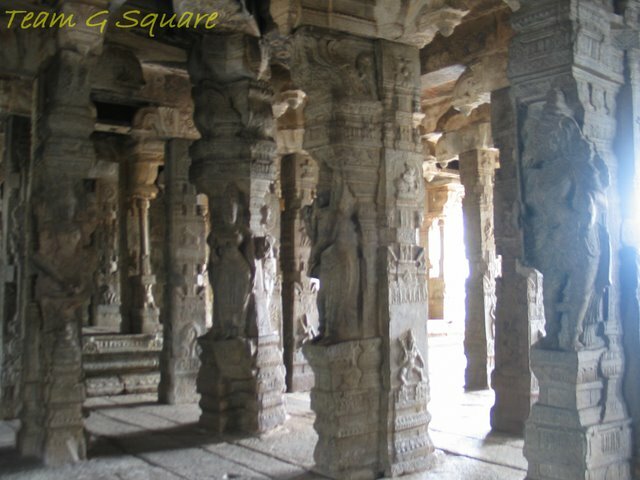 The twelve pillars carry carvings including that of the legendary Dancing Queen Ramhba and the audience watching her dance. The audience include Lord Dattatreya, Shiva, Goddess Parvati, Surya, Tumbara, Riteshwara, Brahma, Nataraja, Chandra and other scholars, some of whom are seen holding musical instruments.The ceiling comprises of a hundred petaled lotus carved out of twelve stones, also called as Shathapatra Kamala in Kannada, meaning hundred petaled lotus). 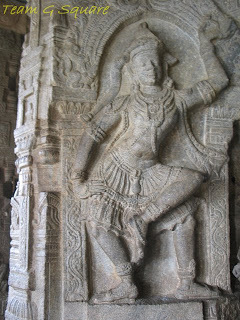 On one of the Pillars, we find the sculpture of the Dancing Guru Brungeshwara, having three legs in the form of hoofs and eyes of a horse with plaited hair, and danced on a par with Rambha. 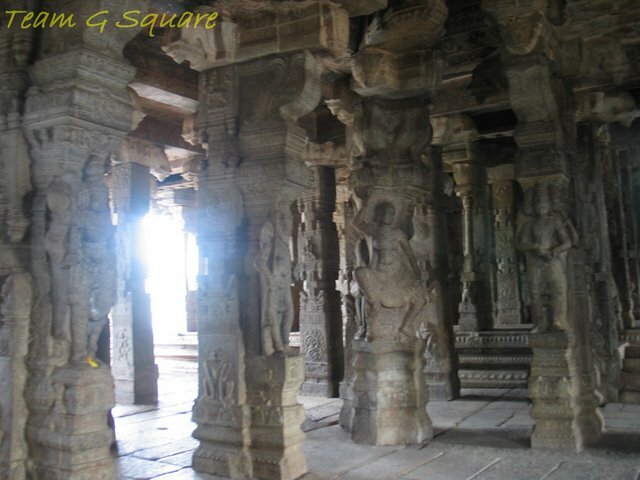 The others pillars of the hall carry miniature carvings of various figurines, floral patterns, and designs. 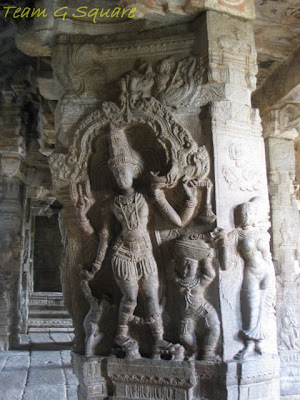 Right behind the carving of Bringeshwara is a carving that describes the story of Bhikshatana, in which Lord Eshwara appears in the form of a man, disguised as a beggar, in order to test Goddess Parvati's devotion. Shiva appears as a in human form as a beggar in front of Parvati's house and calls out 'Bhavathi Bhikshandehi' for seeking alms. 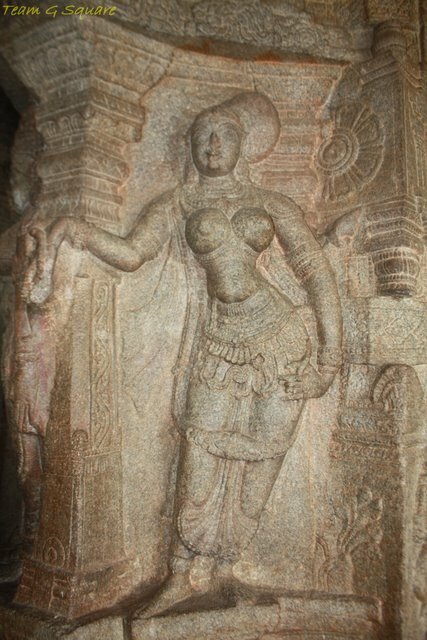 Parvati, who hears the call while bathing, immediately wraps a cloth around her waist and brings rice to partly fill the begging bowl of Lord Shiva. While she goes in to bring milk and ghee, Shiva fills the bowl full with rice. Without losing concentration, and with great devotion, Parvati starts to pour in the milk and ghee. Goddess Parvati is therefore also known as Annapoorneshwari. 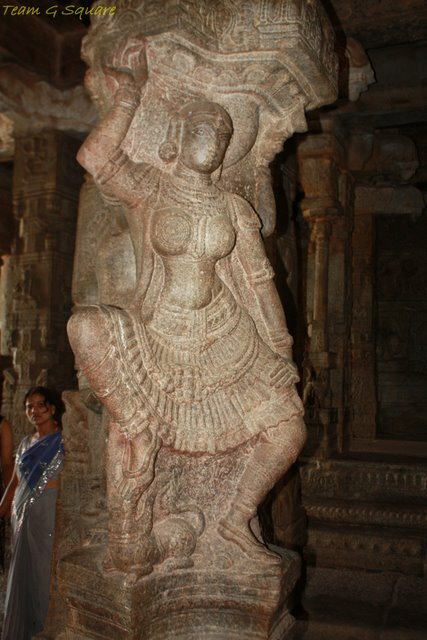 Lord Shiva, whose main intention was to test her degree of devotion, tries to distract her by making the wrapped cloth slip down her waist (This can be seen clearly in the picture below on the right side). Parvati fails to notice this and continues her offering, proving that she is a staunch devotee. Shiva being impressed by her devotion and commitment, appears in his true from as seen in the picture below. To the north east corner of the Natya Mantapa stands tall an 8 feet Pillar, known as the Gravity Pillar. It is also called as the Antarikhsha Sthamba or Moola Sthamba.in Kannada. It is said that during the British rule, in 1902, an Engineer named Lord Hamilton visited the tempe for inspection purposes, at the time of which he pushed the pillar with an iron rod. 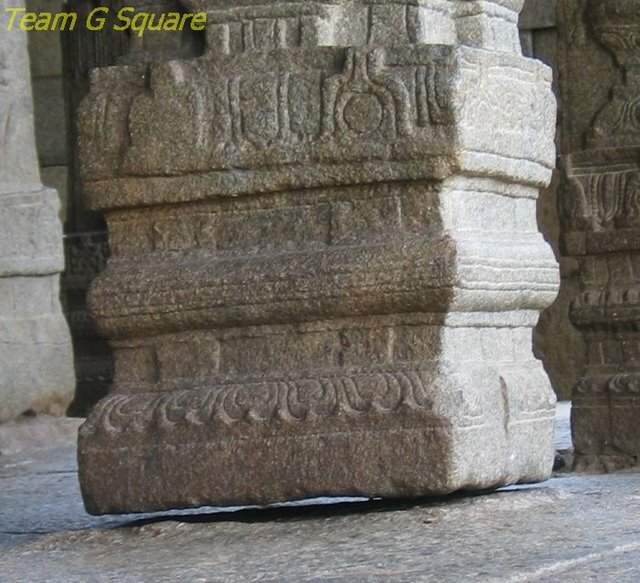 The outcome was that apart from the gravity pillar being displaced by a small amount, all the other pillars were also displaced by a short distance, after which, they feared to touch the pillars further. Hence the name Moola Sthamba or the Main Pillar. The pillar is in contact with the ground for a small portion only, whiile the rest is about half an inch above ground. 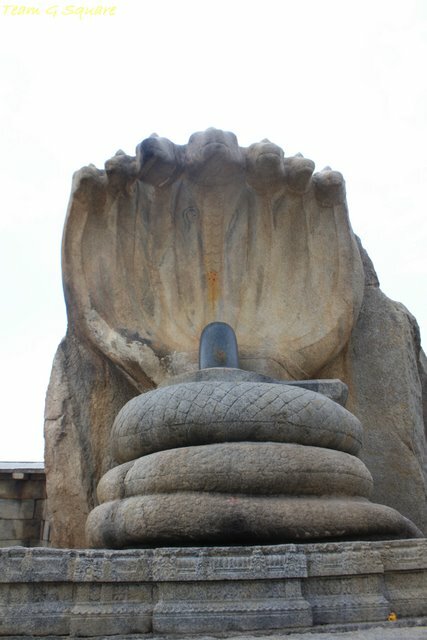 As we enter the second prakara, we see a huge sculpture of a Seven Headed Serpent coiled in three layers, at the center of which is seated an idol of Lord Shiva in the form of a Shiva Linga. The story behind this sculpture is as follows. The kitchen situated right opposite to the serpent sculpture belonged to the sculptors, who prepared their lunch there. One day, it so happened that when the sculptors came to the kitchen for having lunch, it was told by the mother of the main sculptor that it would take some more time in order to make the lunch ready. 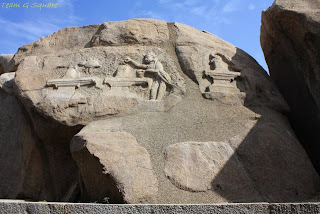 Now, knowing that it would take time and not wanting to waste any time, the sculptors decided to sculpt on the huge rock lying in font of their kitchen, and the result of this was the Seven Headed Serpent. It is believed that, when their mother walked out of the kitchen and saw this piece of beautiful work, she was shocked and surprised at what they had ended up doing in such a short span of time. She cast her eyes ( ('Dhrishti' in Kannada)) on the sculpture and the effect was to such an extent that the sculpture cracked at three places. 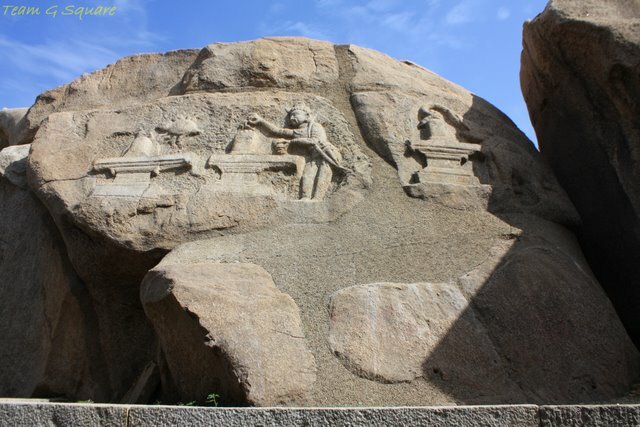 On the rock adjacent to the carving of Lord Ganapthi can be seen carvings of a Spider (Jedara Hula in Kannada), Bedara Kannappa, a Snake and an Elephant, all f whom are seen worshiping the Shiva linga. 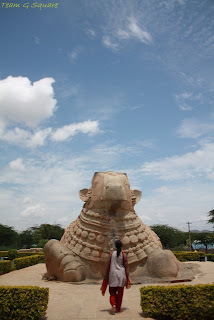 It is therefore believed that Shri Kalahastii existed long before Lepakshi was built. After entering the second prakara, wee see an idol of Ganesha carved on a rock which is about six feet tall.It is a custom that before worshiping Lord Veerabadhraswamy, the devotees have to take the darshana of Lord Ganapathi. 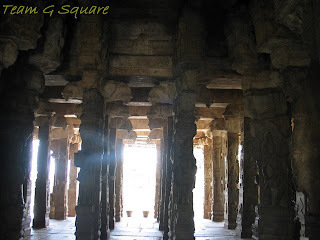 Hence, this place is visited before worshiping Veerabadhraswamy. About 200m away and in line and opposite to the Seven Headed Serpent that houses a Shiva Linga is a big and beautiful idol of Nandi, the guardian of Lord Shiva. 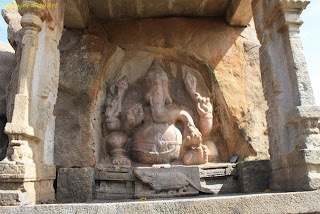 The idol is about 27 feet in length and 15 feet high. 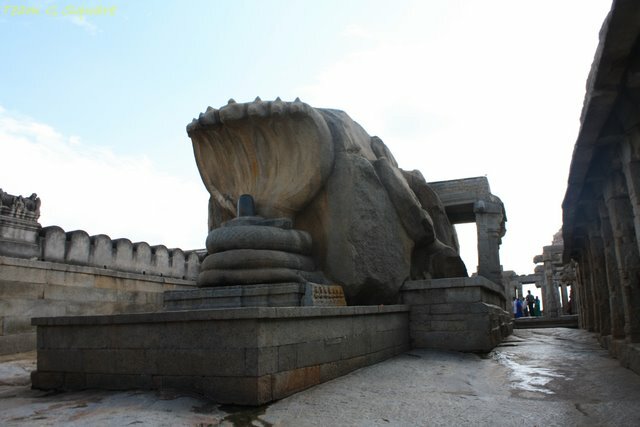 The body of Nandi is decorated with carvings of bells and anklets. Wow! That was impressive. Specially the story of Bhikshatana and the seven headed serpent.Wonderful! Incredible as always and very impressive indeed! Terrific captures! Have a great week! 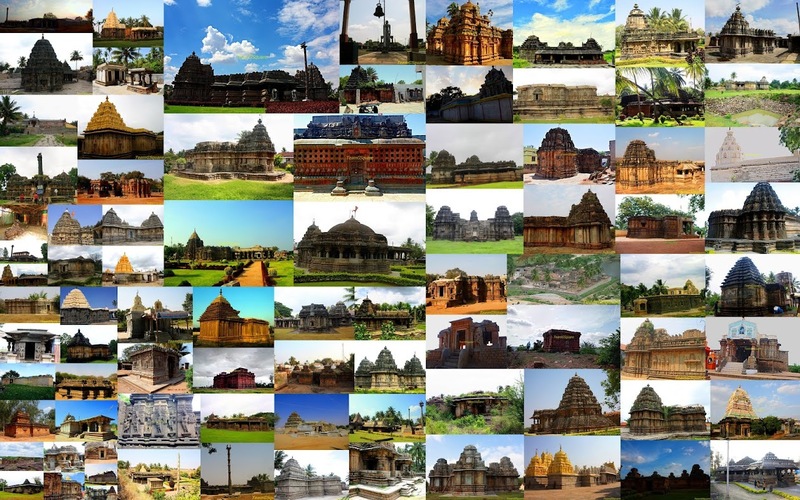 Thank you for your marvelous photos and fascinating information about this incredible temple. The carvings are beautiful. The gravity pillar is amazing. I too was stunned to see such amazing stone work there. Beautiful post...loved the stories behind these sculptures! Thanks! Great shots of a fascinating place. The place has awesome architecture. Loved the write up. amazing work !! are they stones ..? they speak a language of beauty ... finely carved and beautifully captured :) awesome ! !